On September 28, 2015, 150 years after Dr. Alexander Coppel was born and 33 years after the formation of the first municipal comprehensive school at Wupper Street, the ceremonial act on occasion of the name giving of the Alexander-Coppel-Gesamtschule took place. 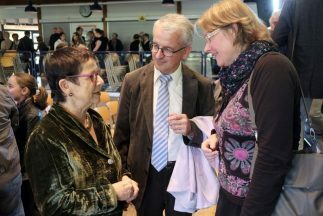 Not only school minister Sylvia Löhrmann appeared at the celebration, also two former mayors, the mayor in chief and the mayor-elected of Solingen showed up, as well as three members of the Coppel family, among them Eleonore Reiche, daughter-in-law of Anna Reiche née Coppel. She was accompanied by her daughter Rita Schwartz from the United States. Also Elizabeth Eichiner from Munich was theres, another granddaughter of Anna Reiche. 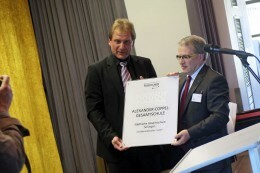 Mayor Norbert Feith presented the new door sign to headmaster Andreas Tempel. 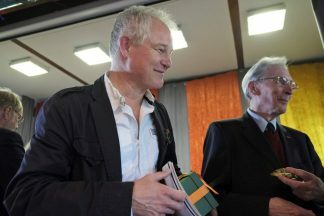 After the greetings of the outgoing mayor Norbert Feith and of school minister Sylvia Löhrmann, the leader of the project group ‚Jewish cemetery‘, Michael Sandmöller, expanded on the special relationship between the school and its name giver once more. „He was deeply connected to his home town and took it as his duty to share his wealth with those who depended on assistance. This held true beyond all religious boundaries.“ So it’s not only about keeping the memory of a family alive which the Nazis wanted to redeem from public memory dispite of all of their merits, but also to deal with their humanistic heritage. 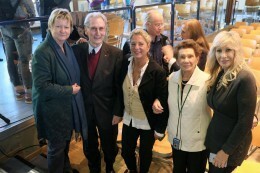 from the left: Sylvia Löhrmann, Wilhelm Bramann, Elizabeth Eichiner, Eleonore Reiche, Rita Schwartz. 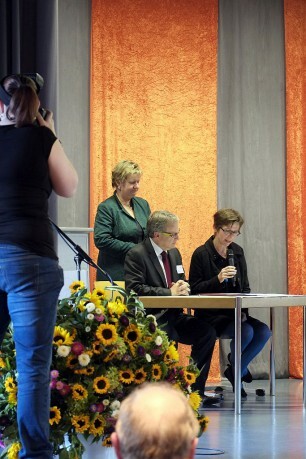 At the close of the celebration, which was accompanied by numerous atmospheric musical contributions from several students, Andreas Tempel and Dr. Ulrike Schrader, head of the Memorial site Alte Synagoge Wuppertal undersigned a cooperation contract, to establish the topic ‚culture of remembrance‘ even deeper in the school profile. „When you are asking for how this all could happen, you must not ask the victims, because they can not tell you. You have to face the inconvenient task, to ask for the perpetrators!“ insisted Schrader. 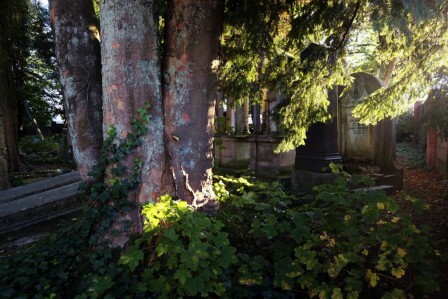 After the champagne reception and an imbiss the senior grades had prepared, the desccendants of the Coppel family went to see the family tombs at the Jewish cemetery. 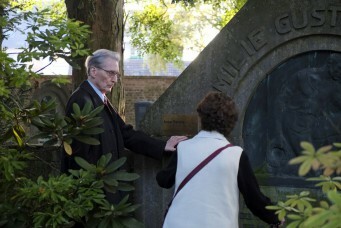 Michael Sandmöller and his predecessor Wilhelm Bramann, who founded the project group ‚Jewish cemetery‘ in 1988, accompanied the three ladies to Estherweg. 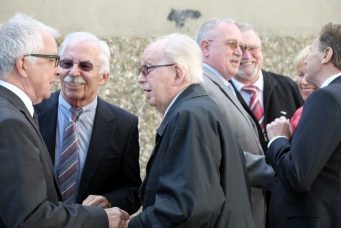 Bernd Krebs, Vorsitzender des Freundeskreises Solingen / Ness Ziona begrüßte den ehemaligen Oberbürgermeister Gerd Kaimer, auf dessen Anregung die „AG jüdischer Friedhof“ gegründet wurde. Auch der ehemalige OB Franz Haug (2.v.l.) nahm an der Feier teil. 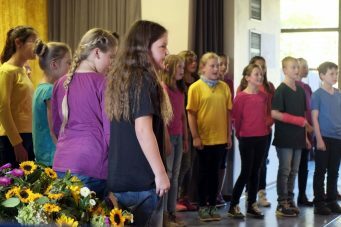 „Warum sind wir, wie wir sind?“ fragten die Schüler_innen der Musical-Projekt-AG. Schulministerin Sylvia Löhrmann, Schulleiter Andreas Tempel und Dr. Ulrike Schrader unterzeichneten den Kooperationsvertrag der Schule mit der Gedenkstätte Alte Synagoge Wuppertal. Michael Sandmöller und Wilhelm Bramann. 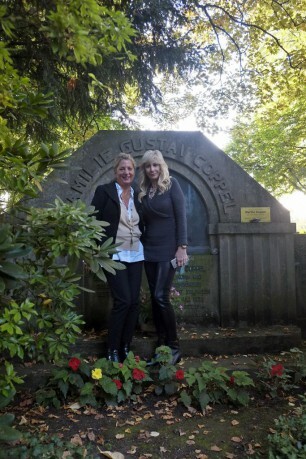 Simone Sassin (rechts), zukünftige Leiterin der „AG jüdischer Friedhof“ im Gespräch mit Haya Cohen, ehem. Lehrerin der Menachem-Begin-Junior-High-School Ness Ziona. Elizabeth Eichiner und Rita Schwartz am Grab ihrer Urgroßeltern Fanny und Gustav Coppel. Wilhelm Bramann zeigte Eleonore Reiche die Tafel für ihre Schwiegermutter Anna Reiche am Grab von deren Eltern. 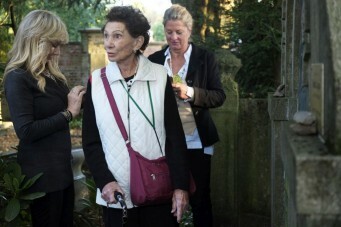 Eleonore Reiche mit Tochter Rita Schwartz und Nichte Elizabeth Eichiner. 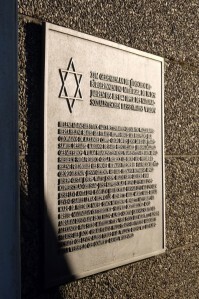 Gedenktafel mit den Namen der jüdischen Opfer des Nationalsozialismus.